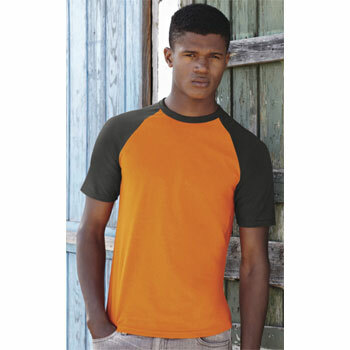 A Fruit of the Loom short sleeved baseball t-shirt available in 7 colour combinations with the neck and sleeves in a contrasting colour to the body of the t-shirt. This affordable gift is a good quality product with a softer feel and fine knit gauge for an enhanced printability ideal for presenting any logo and corporate message. Please contact us directly for design and printing options on this T-Shirt.